Mt. Zion Baptist Church, a handsome redbrick late Victorian Gothic church, is home to one of Asheville's largest congreations of African Americans. 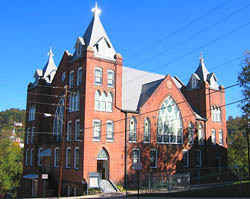 In the spring of 1880, Reverend Robert Parker Rumley established a new African American Baptist church in Asheville, nine blocks west of the current church. Shortly after Reverend Rumley established the church, he and the charter members invited Reverend Frederick Brown from Greenville, South Carolina, to conduct a revival. Until the time of his arrival, the members had not decided on a name for their new church, but during the revival Reverend Brown said, "I will call this church Mount Zion because I have never known a Mount Zion that did not thrive." Reverend Rumley was deeply religious; he preached on Pack Square as well as three church services to capacity crowds every Sunday. Thomas Wolfe's short story "Child by Tiger" draws upon Reverend Rumley's rich and colorful sermons. After 17 years of service, Reverend Rumley left Mount Zion. However, he secured the services of a talented young minister, Reverend Jacob Robert Nelson. In 1919, the new pastor moved his congregation to the heart of the black commercial district. 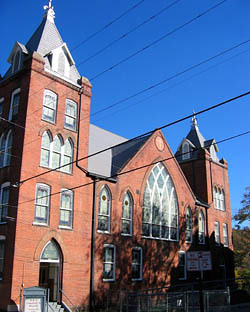 The church was built in 1919 by the Miller Construction Company, which specialized in the construction of churches and commercial buildings such as Hopkins Chapel, Saint James AME, the Municipal Building and several buildings on the north side of Pritchard Park in downtown Asheville. James Vester Miller, a master mason and the son of a former slave, worked for some of the best contractors in Asheville before starting his own company, Miller and Sons Construction Company. Miller and his company built the church, which rises two and one-half stories from the stone foundation to a tin-shingled roof where three towers are topped by ornamental sheet-metal finials. The large number of Art Glass windows that ornament the towers and walls is a remarkable feature. The massive church bears a cornerstone reading, "Mt. Zion Baptist Church, Rebuilt 1919, Reverend J.R. Nelson, Pastor," reflecting the building's long history and importance to the community. Mount Zion Baptist Church is located at 47 Eagle St., near the intersection of S. Spruce St., southeast of Pack Square in the Downtown Asheville Historic District. The church is open to the public. For more information call 828-252-0515.